It's winter. I was thinking of all the cats out there that endure these cold winter months while drawing this cat portrait. One thing I never leave the house with is one of my many winter hats. So, I put a winter hat on this guy. Custom made for his ears. Also, I added a patch to keep it a little weird. I'm a fan of psychedelic comic book art and that art genera. Unfortunately, I sadly have to say that Billy past away last year. The snow is falling and it's cold out there. This cat, Desmond, seems to just take it all. He is definitely the toughest cat I've met with a big heart. 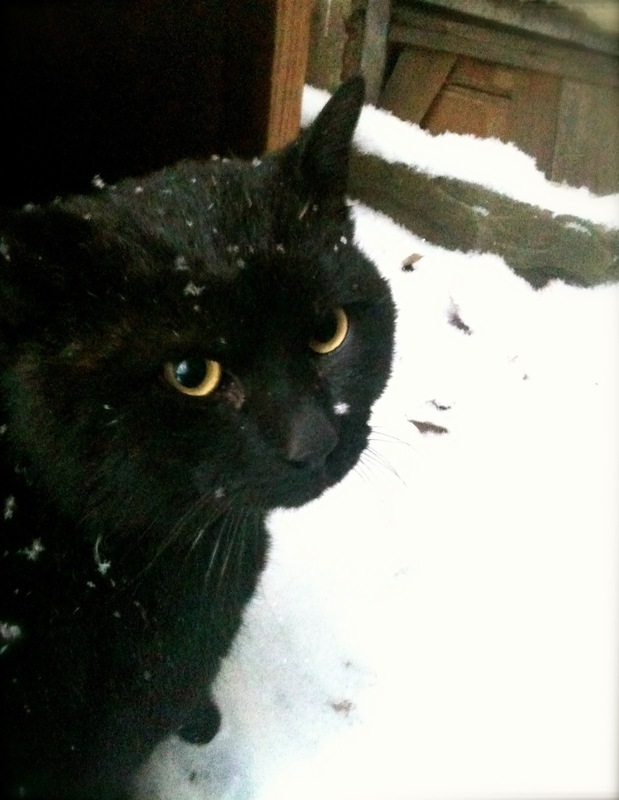 Here he is in January snow with temperatures in the teens coming out to say hi to me. Recently, Desmond came home limping. Holding his left leg close to his body, he trotted over to me. He meowed and rubbed up against me as always. I immediately picked him up to check him out. Underneath his front leg I saw what looked liked teeth marks as if he got in a fight with a dog. "What did you get into now?" I thought to myself. Dang cat! Cold out and hobbling, Desmond still is in happy spirits. It's been a little over a week with his injury and he is now starting to be able to use his front left leg. When he isn't in his little home I built, he will see me walking out to the trash and come walking up to me with his loud meows. Sometimes Desmond is out for a long time. My girlfriend and I say he's busy doing stuff. He always makes it back for dinner though. 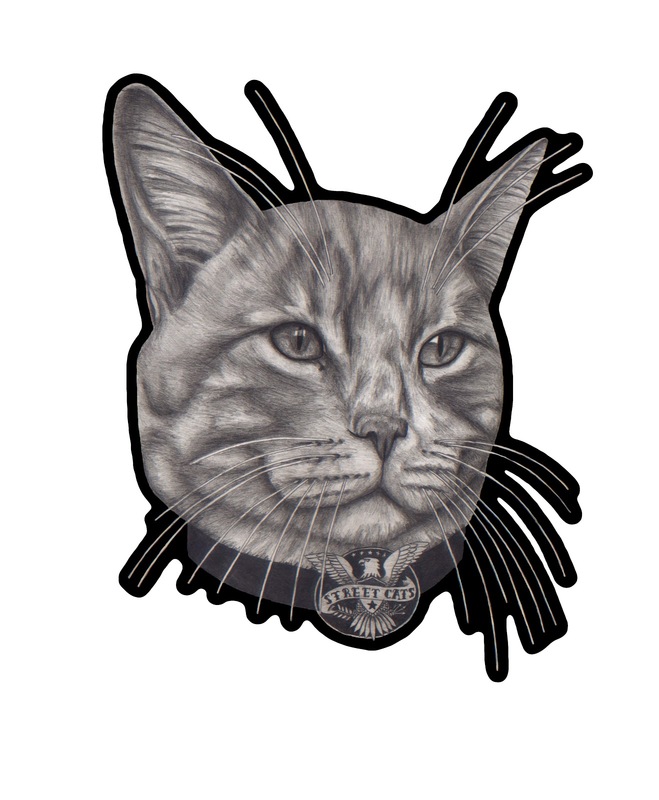 It's Frankie with "street cats" badge on his collar. Frankie is a British short hair cat. He is the most lovable cat with a big head. It's been said that the Cheshire cat features were taken from the British short hair cat. Pretty cool! Frankie lived on the streets of Philly for about a year. So, he is representing in the portrait. He has adjusted very well to being a house cat and loves it. Frankie likes to liven things up around here too! Chauncey, the other cat, is not always amused with him. Hope you like the cat portrait! 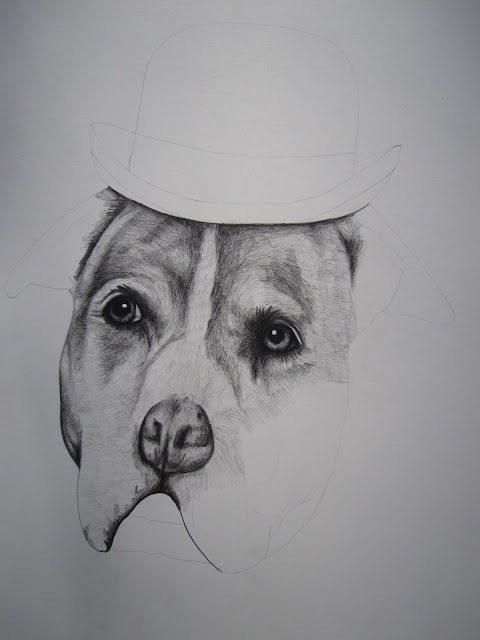 Inquire about getting your pet portait drawn. Do it! Do it. This is Desmond. He is a tough cat with a sweet side to him. I first saw him underneath the cars on the street in my neighborhood. Then, one day, I saw him out back. I called him over and he was all, "meow, meow, meow," at me. I put out a bowl of cat food and water for him. He immediately dug in. Ever since that day, Desmond keeps coming back. He needed a spot for shelter and sleep, of course. So, I built a little house for him. An old end table, cardboard, duct tape, and a towel. Works out great. 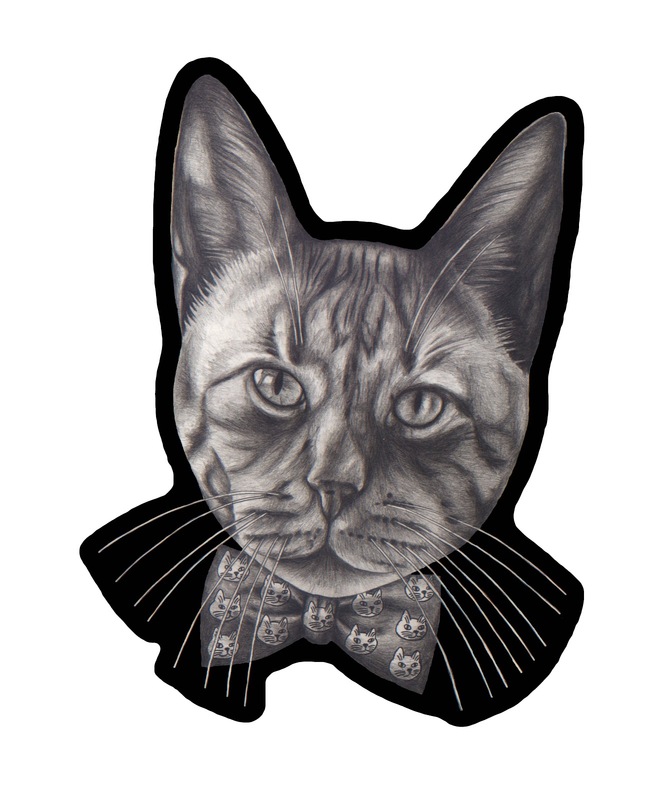 I drew a pet portrait of him already which can be found in the Bad Cat Portraits portfolio. Frankie is one of the cats here at Bad Cat Portraits studio. He's a handsome dude. Look for his pet portrait soon to come! Next up on the drawing table. Pasquale looking all dapper with a cat print bow tie in this pet portrait. A cat has to look good! 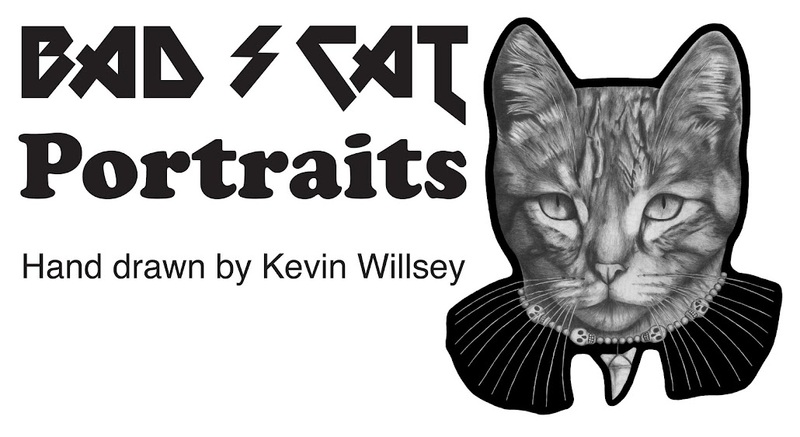 Meet the cats of Bad Cat Portraits studio. Chauncey and Frankie. 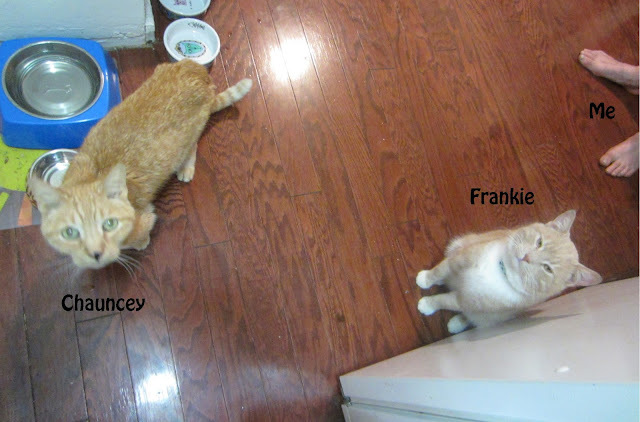 Chauncey has been the meowser here for some time, while Frankie is the new addition. Both kitties were Philly street cats originally. Saved off the street, they now live a sweet cushy life. I think they are super happy about that too! There will most definitely be more posts on these sweet cats. Chauncey was the inspiration of Bad Cat Portraits, being the first pet portrait. Look for Frankie's pet portrait soon to come! 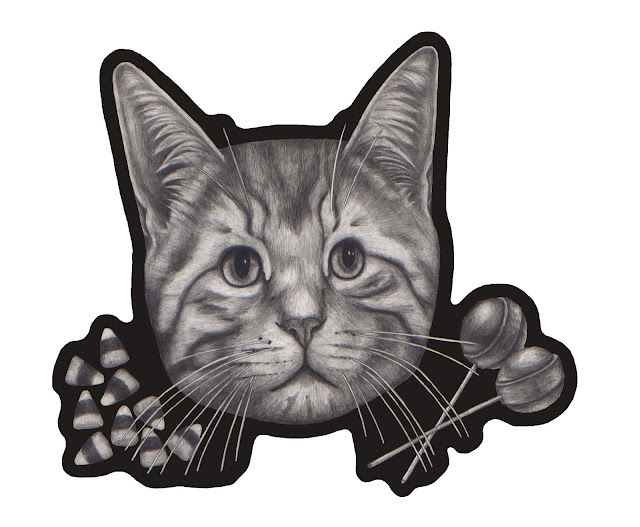 It's the Bad Cat Portraits "favicon" cat! Here is a step by step of my pet portrait of Orion. 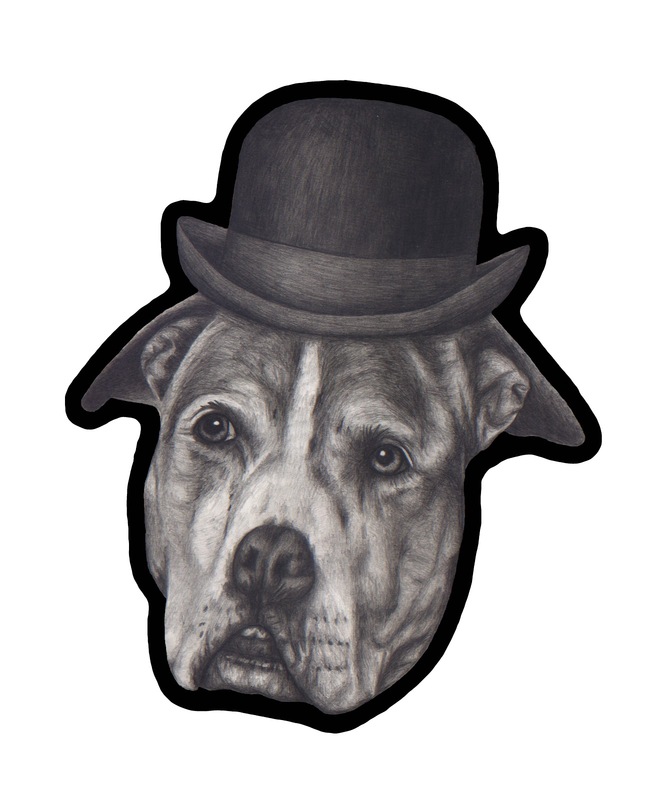 He is one good looking pitbull with a bowler hat on. Once again, I start out my pet portraits on the trusty sketch pad. I like to use a 14" x 17" pad so I have space to draw. 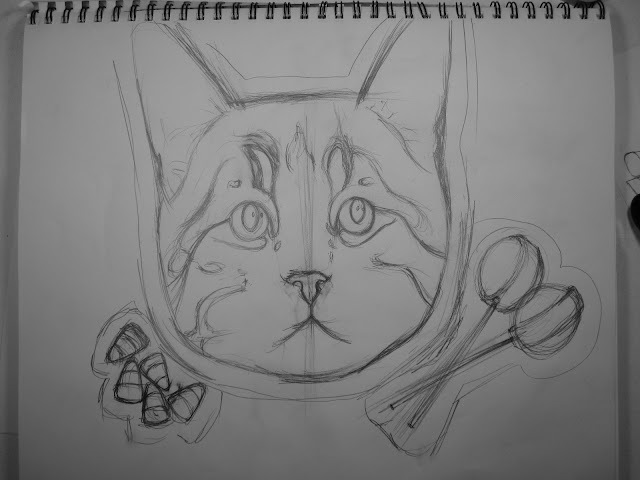 I don't like to be cramped in and lose detail while sketching out a pet. Of course, I always run out room still. Now I'm at the point where sketch has been redrawn a few times with the use of tracing paper. I have rolls of it. When the drawing is drawn out to where I like it, I hit up the photocopy machine. Size it down to fit my paper and I'm set for the final art paper. I like to use bristol smooth paper. The pencil lines come out great, showing texture, depth, and detail. I start out light with shading and progressively get darker. As always, I begin with the eyes. Orion is now all drawn out. I spray the drawing with matte finish to protect it. I don't want the drawing to smear. Then, I brush over the drawing matte varnish. This adds a permanent protection. The varnish also enhances the drawing by giving more depth. The dark areas become denser while the lighter areas pop more. The last step I do is paint a black out line with black acrylic. I will also paint the negative space all white to clean it all up. The black out line makes the pet portrait pop off the page and pull everything together. And now, Orion is finished! Orion looks fresh and boss! Here is Orion looking all boss. I like hats and so I put them on your animals. 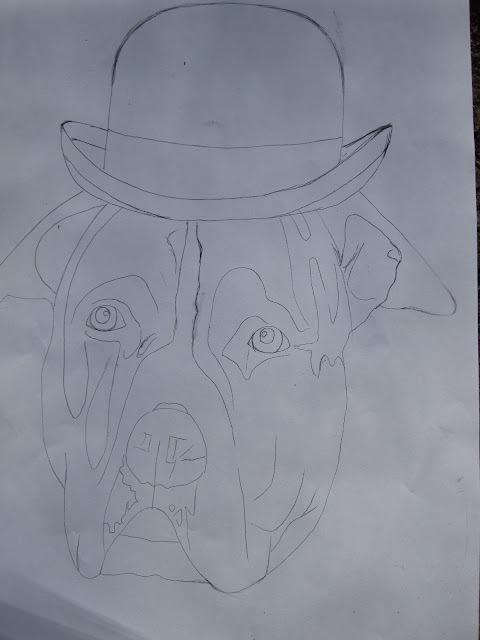 This pet portrait of Orion with his bowler hat looks very fitting to me. 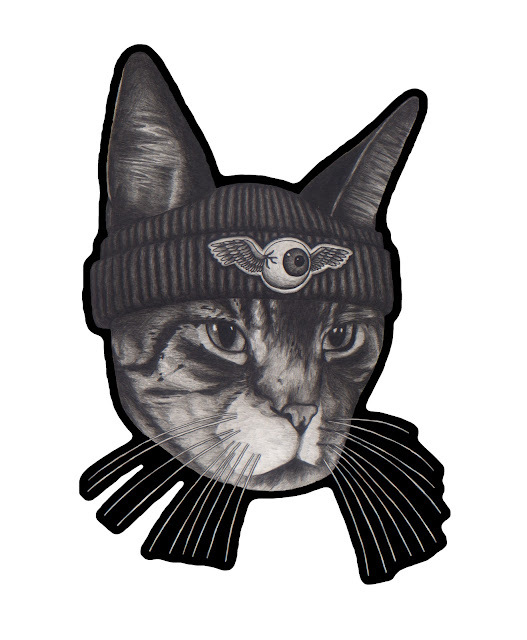 I've been working on a Bad Cat Portraits script. Here is my "ball of yarn script". This will be accompanied by a pet portrait above it. Looks sweet if you ask me! This is a little insight step by step of how I go about my Bad Cat Portraits drawings. The pictures are not that great but you can see the transition from start to finish. I start all my drawings in my sketch book. A pet picture with good detail and decent lighting is best for me to sketch from. I have noticed that a picture that picks up the eyes well is very good for me to draw from. I find the eyes can really make the picture. Usually, that's where i start my drawings. I am a hat person, so I like to add hats to my animals, but I like to make sure I add character that fits the animal or person I'm drawing for. For me, I'm all about bicycles! For Hiwa, it's all about candy corn. There are a few steps missing here. This is now on the final paper. Before I get to this step, I draw, redraw, redraw and redraw on tracing paper to where everything looks right to the littlest detail. ( So I try ). Once the final sketch is drawn and sized to fit on my paper, I use the trusty light table to draw the portrait on the final paper. Begin shading and detailing starts now. Finally, the finished portrait. Hiwa and his love for candy corn. Note, don't leave a bag of candy corn out around this cat! Hiwa, candy corn, and tootsie roll pops. This is Hiwa. I met this orange cat on new year's day, nice cat. I heard a little story about Hiwa liking candy corn as well as the cat owners. Probably a bad thing for cats to eat. Anyways, I came up with this. copyright © 2015. All art is property of Kevin Willsey.. Simple theme. Powered by Blogger.